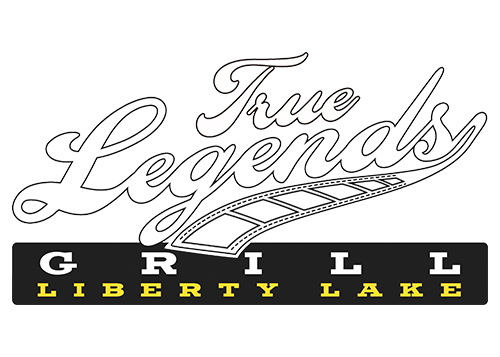 Liberty Lake’s premier casual restaurant featuring a 26’x10′ legendary HDTV. Our signature chowder full of fresh salmon, or choose our chef’s soup of the day. Sauteed shrimp, cabbage, green onions, peanuts and cilantro tossed in our house-made Thai peanut sauce with linguine noodles. This is the entree you won’t want to miss! Chef Kyle’s legendary Salisbury steak slowly cooked in a beef demi-glace gravy, served on top of garlic mashed potatoes. Find out why True Legends is famous for burgers with this new creation, a half pound Angus beef patty with bourbon honey mustard dressing, fried wonton noodles, mushrooms, Swiss cheese, lettuce and tomato. Served with endless fries. Baked to order peanut butter chocolate chip cookie topped with ice cream and chocolate sauce. Housemade brownie topped with vanilla ice cream and chocolate fudge sauce. A mug overflowing with root beer and vanilla Ice cream topped with whipped cream and a cherry for a touch of elegance.